At the top of the hill is a viewpoint which has been vandalised in the past, but looks forgotten about now. No traces of any older structures are visible, although the view up the river towards Middlesbrough is still good. Down by the riverside is interesting as this is one of the only points downstream of Middlesbrough you can access the banks of the Tees without being on private property. A large concrete pillar stands in the water which may correspond to a Slag Conveyer shown in the 1929 OS map, although i’m by no means certain of that. 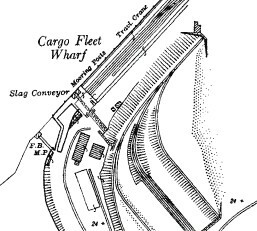 Rows of rotted wooden posts are also visible at the waters edge which presumably are the mooring posts for Cargo Fleet Wharf, although i’m yet to locate a photo of this area in use. It was built as a ‘Cargo Fleet River View’ by the old Cleveland County Council as part of the ongoing South Tees Urban Fringe programme. It was, I seem to recall, on a list of reclamation and landscaping sites visited by Prince Charlie sometime in 1989 / 90 and which I ducked out of. It was built on a foundation of land reclaimed from other local industrial sites. I could see a lot of old bricks spewing out of banks where the wooden retaining fences have rotted and collapsed. Its probably a treasure trove for local industrial archaeology, i’ll certainly be going back for a closer look when i’m not in my clean work clothes. As a land asset from Cleveland CC it would have been vested in the successor council. I’m not sure on which side of the RCBC / MBC boundary it is sited, but whoever owns it should at least make it safe – some of the pics seem to show it in a rough condition, but then it is great for industrial archaeologists at the moment ! ‘Make it Safe’ Euphemism for destroy any remaining items of interest. Not really. Every public body has to be aware of ambulance chasing solicitors. The best one I recall was the dad of a kid who was BMX’ing on a felt flat roofed primary school and went through it, going for a claim. It was laughed out of court, but the costs for council solicitors and barristers was both heavy and ultimately had to be paid by the council tax payer….. This was a regular dog walking spot for me 10-15 years ago . it used to be maintained regularly , grass cut and everything with a car park at the front too . This was filled in and allowed to over grow due to fly tippers . As Mr. Walsh says there was a brass plaque on the view point , opened by Prince Charles , a map pointing to what you could see from it . Also , at that time , the land hadn’t eroded and you could sit on the concrete pillar over looking the river and watch the tugs go up and down . It’s a real shame it’s been allowed to go to ruin like this as it’s a great spot for the general public to see the river up close . I can remember it opening must have been about 1987 as I was an apprentice next door to Graving dock for ITM offshore and Prince Charles did indeed visit/open it. Visited yesterday when I discovered it doesn’t seem to have changed from the photos published above a lot of bricks about but no named ones obviously visible.